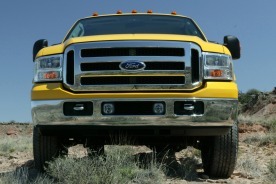 Includes transfer case and fuel tank skid plates, Rancho branded front and rear shocks and "FX4" decal. Includes heavy service front springs, steering damper and auxiliary springs (with 5.4L). 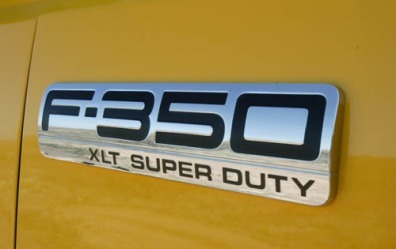 Recommended only on vehicles that will permanently utilize aftermarket equipment such as heavy duty winches, brush guards or other apparatus which loads the front axle to the specified gross axle weight rating (GAWR). Includes an electronic trailer brake controller that is integrated with the vehicles anti-lock braking system allowing smooth braking performance while carrying heavy loads. Includes four (4) LT265/70R17E all-terrain, outlined white-letter tires and one (1) LT265/70R17E all-terrain, black sidewall spare tire. Includes unique all chrome billet-style grille, chrome exhaust tip, chrome tow hooks, unique chrome mirror caps, chrome pickup bed tie down hooks and 5" chrome tubular step bars. Forced on Power Stroke diesel engines. Available as a Fleet only option on 5.4L engine with automatic transmission. Not available on 5.4L engine with manual transmission or 6.8L engine. Includes rubber front and rear floor mats. Includes deletion of carpeted interior trim and replaced with vinyl floor covering. Includes four (4) LT265/70R17E all-season, outlined white-letter tires and one (1) LT265/70R17E all-season, black sidewall spare tire. Includes Autolamp, Autolock, illuminated entry, remote keyless entry with panic feature, two key fobs and wireless keypad for driver door. Includes computer selected springs for snow plow application and rear auxiliary springs. When the 6.0L diesel engine is ordered a 140A alternator and unique fan clutch is included. (Restrictions apply - see Supplemental Reference or Body Builders Layout Book for details). Includes a transmission temperature gauge. Includes four (4) switches located on the instrument panel that can be used to control aftermarket features such as snow plows, auxiliary lights, etc. 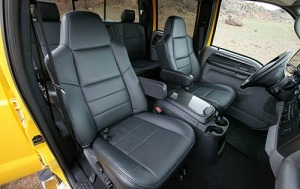 Includes 6-way power driver and passenger seat. Includes TowCommand integrated trailer brake controller and manually telescoping trailer tow mirrors with power and heated glass and integrated clearance lights/turn signals. Includes monochromatic exterior colors, unique body-colored grille, color-keyed bodyside moldings, body-colored front and rear bumpers and door handles, manually telescopic power/heated trailer tow mirrors with integrated clearance lights and turn signals, body colored mirror caps, privacy glass, sliding rear window, fog lamps, chrome tubular step bars, chrome exhaust tip, LT265/70R17E all-season outlined white-letter tires on rear-wheel drive trucks (all-terrain outlined white-letter tires on four wheel drive trucks), unique black leather-wrapped steering wheel, front and rear black throw-in rubber floor mats, unique Ebony carpet and Ebony accents on cluster finish, scuff plates, door trim panels and cowl trim and unique 40/20/40 two-tone Ebony/Charcoal cloth seats. 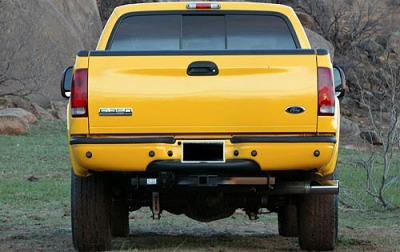 Includes two-tone front bumper and accent color monochromatic rear bumper. Includes 6.0L V8 turbo diesel engine with 325 hp @ 3300 rpm and 570 lb-ft of torque @ 2,000 rpm, boost gauge and engine block heater. Includes premium electronic AM/FM stereo with 6-disc, in-dash CD player and clock.